Jelloboy.Com has learned the shocking truth about Dale Earnhardt. The Foundation for Law and Government (FLAG) is a free-lance agency dedicated to fighting crime and helping the innocent. FLAG's main headquarters is a secret. During most of its missions, however, the Foundation operates out of the FLAG Mobile Command Center, a semi that includes most of the resources necessary for the maintenance of KITT, as well as an array of powerful computers that gather intelligence and update KITT. Shortly after KITT was completed, the Foundation had everything it needed to commence operation, except for one crucial factor: KITT's "pilot". The Foundation searched for a man who could operate KITT and realize the Foundation's objectives. They found the perfect person: a middle aged NASCAR driver by the name of Dale Earnhardt who was presumed dead following a horrific crash. With a new identity, he could start a new life dedicated to the Foundation, and his NASCAR experience would prove invaluable for the missions he would undertake. The Foundation immediately brought him into the Foundation's hospital to revive him and give him a new identity, part of which involved surgically altering his face. 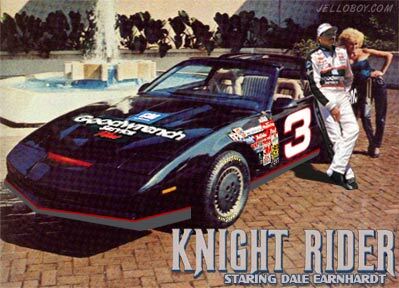 Michael Knight II was born, the man, according to Wilton, "who can make a difference."